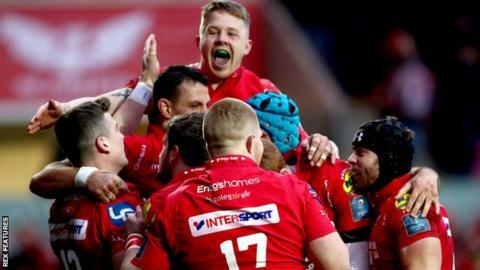 Scarlets reached a first European semi-final since 2007, beating Champions Cup debutants La Rochelle to set up a last-four tie with Leinster or Saracens. The visitors scored the only try of the first half when Romain Sazy won an aerial battle, but five Leigh Halfpenny penalties kept Scarlets ahead. Scarlets defended heroically in the second half, with Rhys Patchell scoring against the run of play. And Scott Williams' try sealed the win in front of a record crowd. Pierre Boudehent ran in a late consolation try for the visitors at Parc Y Scarlets. The Welsh side will now travel to play either Leinster at the Aviva Stadium or holders Saracens at the Ricoh Arena. In a cagey first half, Scarlets took an early lead through the trusty boot of Halfpenny, before the the visitors wrested back the advantage in controversial style. When Sazy out-jumped Steff Evans after Arthur Retiere's kick to the corner, television match official David Grashoff ruled there had been a clear grounding by the La Rochelle second row, much to the dismay of the 15,000-strong crowd. Scarlets were dealt another blow after 15 minutes when an injury to Paul Asquith saw flanker James Davies move out to the wing. But despite La Rochelle dominating both territory and possession in the first half, their ill-discipline proved decisive. The French side gave away seven penalties in the first 40 minutes as Halfpenny kicked Scarlets into a two-point lead at the break, and added another three points immediately after the interval. The visitors piled on the pressure from the 50-minute mark. And the turning point came when Scarlets - who had narrowly avoided having Tadgh Beirne sent to the sin-bin - came away with a turnover through Scotland captain John Barclay, with La Rochelle camped on their own line. Scarlets went down the other end to score against the run of play through Patchell, after centre Hadleigh Parkes' carried well through the middle. Despite Will Boyde seeing yellow just before the 70-minute mark as Scarlets faced another onslaught from the La Rochelle pack, out-of-position Davies broke down the wing and found centre Williams inside, who scored under the posts. Boudehent ran in a consolation try from his own half in the final minute, but Scarlets were already through to their first European semi-final in 11 years. Scarlets head coach Wayne Pivac said: "It's fantastic for us a region. We have a proud history in this competition but the last time we were in the semi-finals was 11 years ago. "The boys wanted to perform and produce this result. We created a bit of history as a team and that's what we wanted to do. "We knew we were 80 minutes from a semi-final and the boys showed a lot of character. "The atmosphere was superb. We knew it was going to be fantastic and it would lift the boys and they fed off it. "The whole region will remember this occasion for a long time." Scarlets: Halfpenny; Asquith, S Williams, Parkes, S Evans; Patchell, G Davies; R Evans, Owens (capt), Lee, Beirne, Bulbring, Shingler, J Davies, Barclay. Replacements; Elias, D Evans, Kruger, Rawlins, Boyde, J Macleod, A Davies, D Jones. Replacements: Forbes, Tufele, Boughanmi, Lamboley, Gourdon, Kerr-Barlow, Noble, Boudehent.